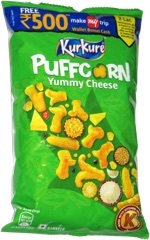 Taste test: These are delicious, excellent potato chips. They've got a mild black pepper zing, with tons of great flavor packed in. It's definitely less peppery than some black pepper chips, so there must be something about the sea salt that gives these more flavor than the others. The initial taste is great, and there's an awesome aftertaste too. Plus, they pack a lot more chips into Canadian chip bags than they do in America. Let's hope they don't really make this just a limited edition flavor. Smell test: Very nice black pepper smell, makes your mouth water a little. 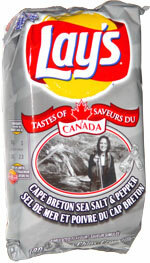 From the package: “To celebrate the unique tastes that make this country great, we're proud to present Lay's Tastes of Canada. We've traveled coast to coast to find true Canadian flavours to be introduced twice a year. So take a cross-country tour with Lay's potato chips. Born in Mabou, Cape Breton, musician Bonny Jean MacDonald knows all about tradition. For her, it starts with family, friends and music. Bonny Jean's traditional fiddling is as much a product of the island she calls home as it is a tribute to the people living there. To salute this one-of-a-kind place, Lay's potato chips introduces Canada Cape Breton Sea Salt & Pepper, seasoned with real sea salt and black pepper for a maritime tradition you'll never forget.